Last week, in addition to that haul, I did go to the store to buy a red bell pepper which cost me a whopping $2.08 (in addition to two hours of my life) so I really tried to ensure that I wouldn’t have to make a second trip this week. 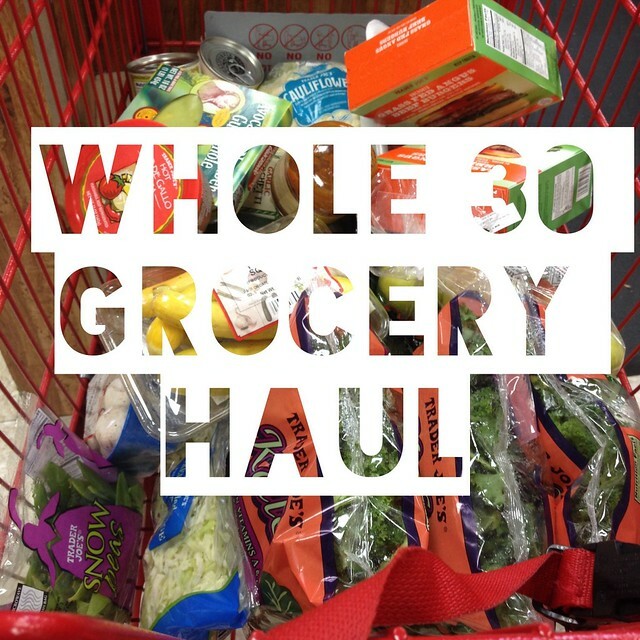 I went to three stores (eep!) but we needed a good variety of stuff and I try to shop at the store that sells the products we buy for the cheapest price. For lunches I made a huge batch of Paleo Minestrone for me and for Garrett I made boxes filled with roasted kale and Trader Joe’s grass fed beef burgers. Dinners, again, will be a mix of protein and veg that I’ll document on Instagram, but I did make a batch of Rogan Josh and Greek Beef Stew because we picked up some stew meat. But I’m getting ahead of myself. While I was at Trader Joe’s I sent Garrett to Costco with a list. Unfortunately it was not specific enough (you know how this goes sometimes, right ladies? :)) So we generally buy the Organic Ground Beef from Costco which is about $4.99/lb and comes 4.5 lbs to a package. I guess Garrett wasn’t paying attention because he came home with regular ground beef. No big deal. This is as good of a time as any to point out that Whole 30 isn’t only about buying the most expensive meat and produce you can find. I think sometimes people have the misunderstanding that Whole 30 means you must buy the absolutely best and cleanest possible ingredients. Sure, that would be great, but that’s not always in everyone’s budget. Here’s a handy dandy guide to what is Good-Better-and-Best that I’ve found helpful in the past. If you want to try a Whole 30 but think you can’t afford expensive produce and meat, I’d definitely take a look at that. This week we’ll just drain the fat off the ground beef and roll with it. 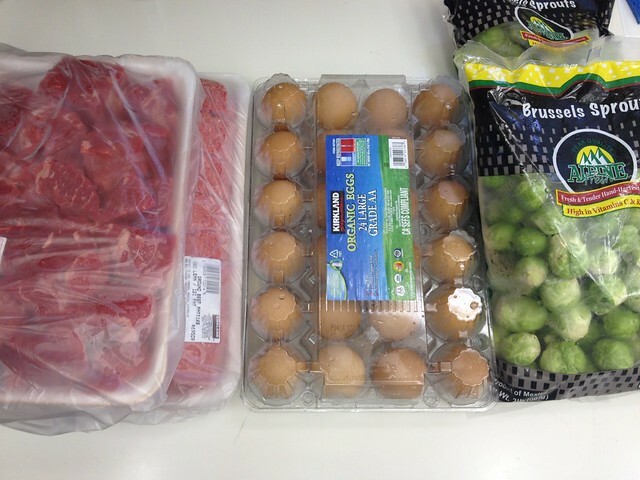 We also picked up stew meat, eggs and brussels sprouts. As you can see we had to stock up on some protein this week so we spent more than last week, which is reasonable. We will probably have to do this a bit next week as well because last week we finished up our shrimp and andouille sausage stash. We still have a few packages of chicken thighs, but after that our freezer meats are basically used up. So far for two weeks worth of Whole 30 grocery shopping we’ve spent $204.88, which seems mighty reasonable to me for 40+ meals. That’s all for this week. Hope this has been helpful in some way! Grass fed frozen burgers?! Thank you for introducing us. I will be buying some tonight. They also have frozen bison burgers that we love too for a change up. This is super helpful. 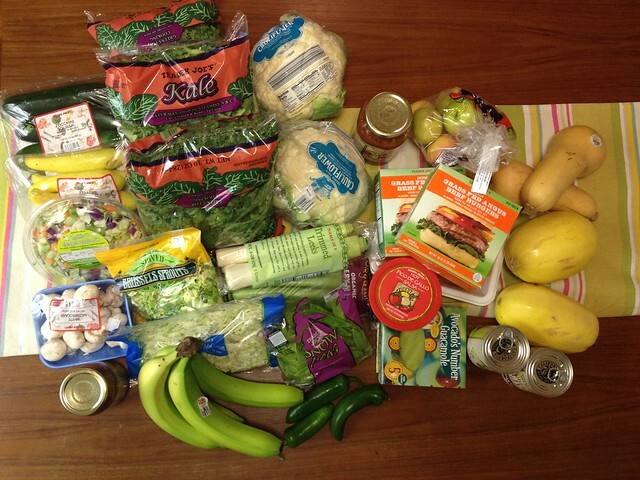 We’ve been trying to get better about our grocery budget because we had a rather eye opening experience when we sat down to see what we really spend in a month. YIKES. I have to remind myself that especially on a budget the non-grass fed and well loved protein will suffice and is still much better than say, pasta and cereal.